Recent reports highlighted the chemotactic activities of antimicrobial peptide defensins whose structure, charge, and size resemble chemokines. By assaying representative members of the four known families of chemokines we explored the obverse: whether some chemokines exert antimicrobial activity. In a radial diffusion assay, only recombinant monokine induced by IFN-γ (MIG/CXCL9), IFN-γ-inducible protein of 10 kDa (IP-10/CXCL10), and IFN-inducible T cell α chemoattractant (I-TAC/CXCL11), members of the IFN-γ-inducible tripeptide motif Glu-Leu-Arg (ELR)− CXC chemokines, were antimicrobial against Escherichia coli and Listeria monocytogenes. Similar to human defensins, antimicrobial activities of the chemokines were inhibited by 50 and 100 mM NaCl. 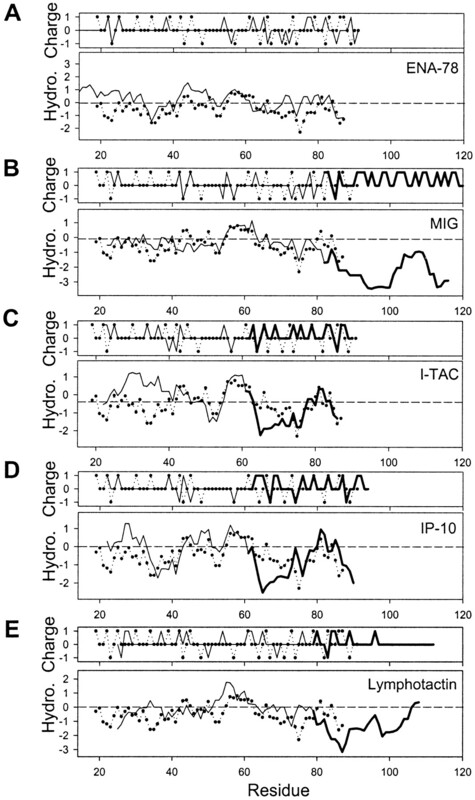 The concentration of MIG/CXCL9 and IP-10/CXCL10 released from IFN-γ-stimulated PBMC in 24 h were, respectively, 35- and 28-fold higher than from unstimulated cells. Additionally, the amounts of chemokines released per monocyte suggest that, in tissues with mononuclear cell infiltration, IFN-γ-inducible chemokines may reach concentrations necessary for microbicidal activity. IFN-γ-inducible chemokines may directly inactivate microbes before attracting other host defense cells to the area of infection. Chemokines are chemotactic cytokines that are important regulators of leukocyte-mediated inflammation and immunity (1, 2). Four families of chemokines have been identified to date, grouped according to the number and arrangement of conserved N-terminal cysteine motifs: C, CC, CXC, and CX3C, where “X” is a nonconserved amino acid residue (reviewed in Refs. 3, 4 ; proposed nomenclature in Table I⇓; Ref. 5). The CXC chemokines and CC chemokines are the largest families with each member containing four cysteine residues. Most chemokines are 8–10 kDa, cationic at neutral pH, and share 20–70% amino acid sequence homology (1, 2). CXC chemokines are subdivided into two classes based on the presence or absence of a tripeptide motif Glu-Leu-Arg (ELR),3 N-terminal to the conserved CXC region (1). Members that contain the motif (ELR+) are potent chemoattractants for neutrophils and promoters of angiogenesis, whereas those that do not contain the motif (ELR−) are potent chemoattractants for mononuclear cells, and the group that is inducible by IFN-γ are potent inhibitors of angiogenesis (reviewed in Ref. 6). Antimicrobial peptides are natural peptide antibiotics that have been isolated from myeloid cells and the epithelial surfaces of most animal species tested to date (7). When the host is challenged by microbes, these peptides act in the first line of innate defense before the activation of adaptive immunity. Many antimicrobial peptides have broad-spectrum activity against Gram-positive and -negative bacteria as well as fungi and some enveloped viruses (7, 8, 9). Antimicrobial peptides share common properties, including low molecular mass and cationic charge at physiologic pH, that facilitate peptide binding and insertion into microbial membranes. Peptides then aggregate into pores, and it is thought that microbial lysis and ensuing death occur once a critical number of pores have formed (10, 11). The α-defensins are a class of antimicrobial peptides that constitute ∼30% of the granule protein of human neutrophils (9, 12). The α-defensins-1 and -2, which contain a conserved CXC motif in the N-terminal region of the mature peptide as well as a structurally related β-defensin, have also been shown to be chemotactic for leukocytes at subnanomolar concentrations (13, 14, 15, 16). Because defensins and certain chemokines share similar characteristics, including size, disulfide bonding, IFN-inducibility, and cationic charge at neutral pH, we analyzed the antimicrobial activity of representative chemokines from all four families to determine whether chemokines have defensin-like antimicrobial activity. Recombinant monokine induced by IFN-γ (MIG/CXCL9) was purchased from R&D Systems (Minneapolis, MN). Recombinant IFN-γ-inducible protein of 10 kDa (IP-10/CXCL10), IFN-inducible T cell α chemoattractant (I-TAC/CXCL11), IL-8 (IL-8/CXCL8), epithelial neutrophil-activating protein-78 (ENA-78/CXCL5), monocyte chemoattractant protein-1 (MCP-1/CCL2), macrophage inflammatory protein-1α (MIP-1α/CCL3), macrophage inflammatory protein-1β (MIP-1β/CCL4), fractalkine/CX3CL1 (chemokine domain), RANTES/CCL5, and lymphotactin/XCL1 were purchased from PeproTech (Rocky Hill, NJ). The α-defensin, human neutrophil peptide-1 (HNP-1), was purified from human blood neutrophils (12). Protegrin-1 (PG1), a generous gift from Dr. R. I. Lehrer (UCLA Department of Medicine), is a synthetic porcine peptide based on its natural sequence. Synthetic protegrin was purified to >96.5% homogeneity by reversed-phase HPLC and was used as a control for antimicrobial assays. For each experiment, two 10-ml tubes of blood, supplemented with 50 U of heparin, were obtained by phlebotomy from healthy volunteers. An additional tube free of anticoagulants was used to generate autologous serum. Heparinized blood was centrifuged at 200 × g for 10 min at room temperature, overlaid onto 4 × 3.5 ml of PMN solution (Robbins Scientific, Sunnyvale, CA), and centrifuged at 400 × g for 30 min at room temperature. The mononuclear cell fraction was transferred to DMEM/20 mM HEPES, washed twice in DMEM/20 mM HEPES, and plated in 6- or 12-well Falcon plates (Fisher Scientific, Springfield, NJ). Wells were supplemented with 2 or 10% autologous serum, with or without 10, 100, or 1000 U/ml of IFN-γ (BD PharMingen, San Diego, CA), and incubated for 24 h. Following incubation, medium supernatant was aspirated and clarified of nonadherent cells by centrifuging at 500 × g for 10 min. Adherent cells were removed with HBSS (Fisher), and total and differential leukocyte counts were performed (Diff-Quik; Dade Behring, Newark, DE). Monocytes represented >95% of adherent cells and 20–30% of the total number of cultured cells. Antigenic human MIG/CXCL9 and human IP-10/CXCL10 were quantitated by ELISA as previously described (17). Briefly, flat-bottom 96-well microtiter plates (Nunc, Copenhagen, Denmark) were coated with 50 μl/well of polyclonal anti-human IP-10/CXCL10 Ab or polyclonal anti-human MIG/CXCL9 Ab (1 ng/ml in 0.6 M NaCl, 0.26 M H3BO4, and 0.08 N NaOH, pH 9.6) for 24 h at 4°C and then washed with 1× PBS/0.05% Tween 20 (wash buffer). Nonspecific binding sites were blocked with 2% BSA. Plates were rinsed, and samples were added (50 μl/well), followed by incubation for 1 h at 37°C. Plates were then washed, and 50 μl/well of the appropriate biotinylated polyclonal Ab (3.5 ng/ml in wash buffer and 2% FCS) was added for 45 min at 37°C. Plates were washed three times, streptavidin-peroxidase conjugate (Bio-Rad, Richmond, CA) was added, and the plates were incubated for 30 min at 37°C. Chromogen substrate (Kirkegaard & Perry Laboratories, Gaithersburg, MD) was then added, reaction was stopped with an equal volume of 2.5 M sulfuric acid, and plates were read at 450 nm in an automated microplate reader (Bio-Tek Instruments, Winooski, VT). Standards were half-log dilutions of recombinant MIG/CXCL9 or recombinant IP-10/CXCL10 from 100 ng to 1 pg/ml (50 μl/well). Listeria monocytogenes strain EGD and Escherichia coli strain ML-35p are laboratory test strains that were treated as described previously (18). Briefly, liquid nitrogen-frozen stationary cultures of either strain were subcultured immediately before use in 50 ml 3% trypticase soy broth (TSB) at 1/1000 dilution (E. coli) or 1/100 dilution (L. monocytogenes) for 2.5 h at 37°C in an environmental shaking incubator (250 rpm) to obtain microbes in mid-logarithmic growth phase. Subcultures were centrifuged at 1400 × g for 10 min, washed in 10 mM sodium phosphate, pH 7.4 (sodium phosphate), resuspended in 1–5 ml of 10 mM sodium phosphate, and diluted to the desired concentration in 10 mM sodium phosphate. For each bacterial strain an OD625 = 1.0 was equivalent to 2.5 × 108 CFU/ml. Radial diffusion assays (RDAs) were performed as previously described (19). The underlay consisted of 1% agarose and 1/100 dilution of TSB with 4 × 106 bacteria in either 1) 10 mM sodium phosphate, pH 7.4, 2) 10 mM sodium phosphate/50 mM NaCl, pH 7.4, or 3) 10 mM sodium phosphate/100 mM NaCl, pH 7.4. Overlay consisted of 6% TSB and 1% agarose in dH2O. After agarose solidified, a series of 3.2-mm-diameter wells were punched and 5 μl chemokines were added. Plates were incubated for 3 h at 37°C to allow peptide diffusion. The microbe-laden underlay was then covered with 10 ml of molten nutritive overlay, and the plates were allowed to harden. Antimicrobial activity was identified as a clear zone around the well after 18-h incubation at 37°C, and are represented in radial diffusion units: (diameter of clear zone in millimeters − well diameter) × 10. The x-intercept of the relationship between zone diameter vs log10 peptide concentration was determined by least mean squares regression, and equated to the minimal inhibitory concentration (MIC). We examined the antimicrobial activity of chemokines because they are small polypeptides, many are cationic at neutral pH, and several are induced by IFN-γ in monocytes (20). In an initial screen, eleven chemokines were tested for antimicrobial activity against E. coli using an RDA (10 mM sodium phosphate, pH 7.4) with representatives from the C, CC, CXC (both ELR+ and ELR−), and CX3C groups (Table I⇑). Although the three ELR− CXC chemokines were antimicrobial, members from all other groups had no detectable activity. Note that although RANTES/CCL5 was not antimicrobial in our system, Tang and colleagues (21) noticed activity in a more permissive acidic buffer (pH 5.5). A secondary structure analysis of chemokine hydrophobicity (22) revealed that ELR− chemokines differed from ELR+ CXC chemokines in the polarity and charge of the C-terminal segment (Fig. 1⇓). Although the ELR+ CXC chemokines, IL-8/CXCL8, and ENA-78/CXCL5, were predominantly apolar (Fig. 1⇓A), the ELR− CXC chemokines, MIG/CXCL9 (Fig. 1⇓B), I-TAC/CXCL11 (Fig. 1⇓C), and IP-10/CXCL10 (Fig. 1⇓D) each contained a C-terminal segment rich in positively charged amino acids. Many antimicrobial peptides interact with the anionic moieties on the surface of bacteria before inserting in the membrane and forming pores (reviewed in Refs. 7, 23). Accordingly, amphipathic molecules with a higher positive charge density are generally more potent microbicides. Because other chemokines (e.g., lymphotactin, Fig. 1⇓E) have an overall isoelectric point (pI) approaching or exceeding the pI of ELR− CXC chemokines (Table I⇑), it is probable that the positively charged residues must be concentrated in the C terminus to confer antimicrobial activity. The net positive charge of the C-terminal ∼35 residues of MIG/CXCL9 (+18 charge), IP-10/CXCL10 (+9), and I-TAC/CXCL11 (+8) are substantially higher than lymphotactin/XCL1 (+4), IL-8/CXCL8 (+1), and ENA-78/CXCL5 (+1). Interestingly, the first ∼65 residues of MIG/CXCL9 and IL-8/CXCL8 are similarly charged (Fig. 1⇓B), so the highly cationic tail is likely responsible for its antimicrobial activity. Conversely, the nonpolar tail of lymphotactin/XCL1 could interfere with activity (Fig. 1⇓E). We then explored the antimicrobial activity against E. coli and L. monocytogenes using an RDA in low (10 mM sodium phosphate, pH 7.4), medium (10 mM sodium phosphate, pH 7.4 + 50 mM NaCl), and high (10 mM sodium phosphate, pH 7.4 + 100 mM NaCl) ionic concentrations. Fig. 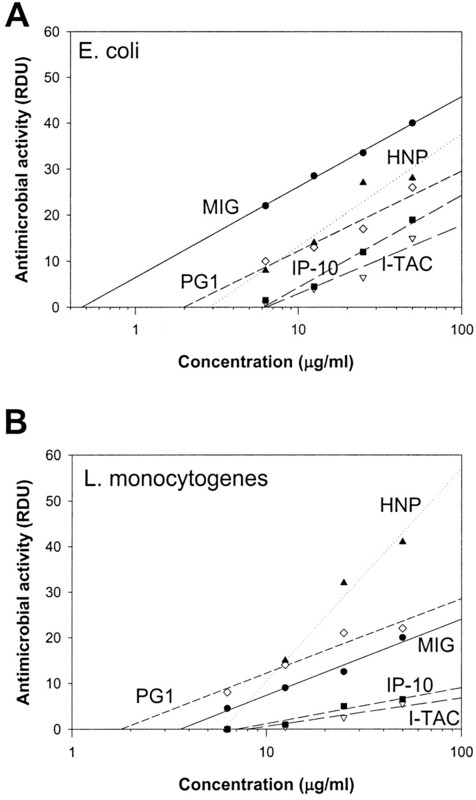 2⇓ demonstrates that the activity of IP-10/CXCL10, I-TAC/CXCL11, and MIG/CXCL9 were similar to an α-defensin (HNP-1) and a potent salt-resistant peptide (PG1) against E. coli and L. monocytogenes. The x-intercepts of RDA plots of serially diluted polypeptides correspond to the MIC, and similar plots (data not shown) were used to calculate the MIC of each chemokine in different buffer conditions (Table II⇓). The noticeable salt sensitivity of ELR− CXC chemokines was similar to defensins and many other antimicrobial peptides (9). This study is the first to demonstrate the microbicidal activity of monocyte-derived chemokines. Several reports have demonstrated that chemokines from platelets are antimicrobial (Refs. 24, 25 , and references therein) and the activity of the platelet chemokines, connective tissue-activating peptide-3 and neutrophil-activating peptide-2 (NAP-2), were enhanced by removal of two amino acids, one of which was a negatively charged aspartic acid (26). We next asked whether antimicrobial concentrations of chemokines could be generated under biologically relevant conditions. The concentrations of human MIG/CXCL9 and IP-10/CXCL10 from PBMC supernatants stimulated with IFN-γ were determined by ELISA (Fig. 3⇓). 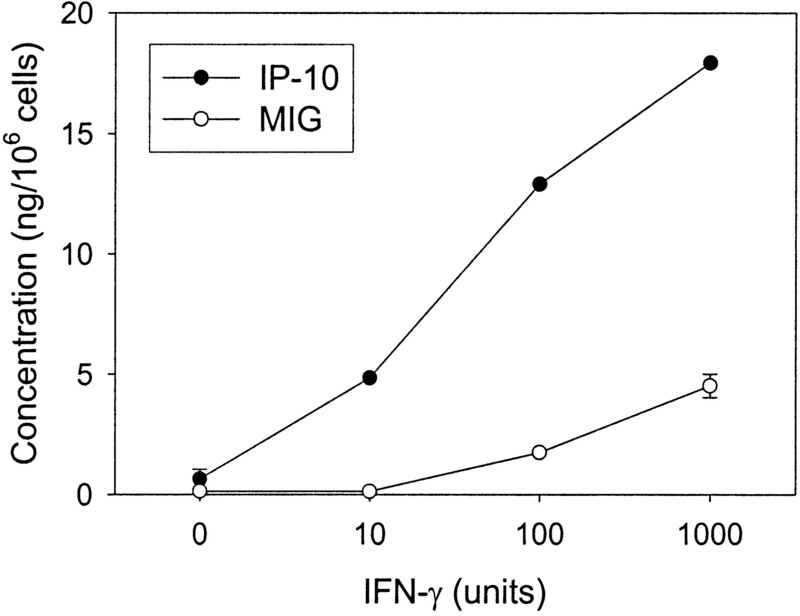 Based on the amounts of MIG/CXCL9 and IP-10/CXCL10 induced with 1000 U of IFN-γ (17.9 ng/106 monocytes and 4.5 ng/106 monocytes, respectively) the calculated density of monocytes required for in vitro antimicrobial activity of MIG/CXCL9 (MIC = 0.5 μg/ml) and IP-10/CXCL10 (MIC = 4.4 μg/ml) was 1.1 × 108 monocytes/ml (MIG/CXCL9) and 2.5 × 108 monocytes/ml (IP-10/CXCL10). Given the size of monocytes, these densities could be reached in dense clusters of monocytes or macrophages that form during chronic inflammation. Moreover, in supernatants of IFN-γ/TNF-α-stimulated normal human bronchial epithelial cells (27) these chemokines reach concentrations of several hundred nanograms per milliliter. Similar concentrations have been shown to be reached in vivo, as measured in plasma of patients with severe melioidosis (28). Furthermore, chemokines and lysozyme are produced simultaneously by IFN-γ-stimulated monocytes, and their combined activity is likely additive or synergistic. IFN-γ administered therapeutically to patients with chronic granulomatous disease improves the ability of phagocytes to clear bacterial infections (reviewed in Ref. 29). Although there is controversy, it is quite plausible that the increase in antimicrobial activity results from oxygen-independent bactericidal mechanisms, including the IFN-γ-inducible ELR− CXC chemokines. If, as we would expect, even higher concentrations prevail in the microenvironment of chemokine-secreting cells, antimicrobial effects could occur through the individual or combined activities of one or more of these chemokines. Under these conditions, ELR− CXC chemokines released by sentinel cells could directly target and inactivate microbial pathogens while also serving as signals for recruitment of leukocytes to infected tissues. 1 This work was supported in part by National Institutes of Health Grants P50 HL67665, HL46809, and AI48167 (to T.G.) and P50 HL67665, P50 CA90388, HL66027, and CA87879 (to R.M.S. ); grants from Cystic Fibrosis Research, Inc. and the Cystic Fibrosis Foundation (to T.G. ); and a postdoctoral fellowship from the American Lung Association (to A.M.C.). 3 Abbreviations used in this paper: ELR, tripeptide motif Glu-Leu-Arg; MIG/CXCL9, monokine induced by IFN-γ; IP-10/CXCL10, IFN-γ-inducible protein of 10 kDa; I-TAC/CXCL11, IFN-inducible T cell α chemoattractant; ENA-78/CXCL5, epithelial neutrophil-activating protein-78; MCP-1/CCL2, monocyte chemoattractant protein-1; MIP-1α/CCL3, macrophage inflammatory protein-1α; MIP-1β/CCL4, macrophage inflammatory protein-1β; HNP-1, human neutrophil peptide-1; PG1, protegrin-1; TSB, trypticase soy broth; RDA, radial diffusion assay; MIC, minimal inhibitory concentration; pI, isoelectric point. Lehrer, R. I., C. L. Bevins, T. Ganz. 1999. Defensins and other antimicrobial peptides. P. L. Ogra, and J. Mestecky, and M. E. Lamm, and W. Strober, and J. Bienenstock, and J. R. McGhee, eds. Mucosal Immunology 89-99. Academic Press, San Diego. Billiau, A., K. Vandenbroeck. 2000. IFN-γ. J. J. Oppenheim, and M. Feldmann, and S. K. Duram, and T. Hirano, and J. Vilcek, and N. A. Nicola, eds. Cytokine Reference. A Compendium of Cytokines and Other Mediators of Host Defense 641-688. Academic Press, New York.